You will notice this tea’s plucking standard is a bit coarser and its oxidation a bit lighter than other Anxi wulongs. The relatively mild brew that results is well suited for the green tea drinker who is curious to explore some of the nuance of wulong tea without straying too far from a familiar flavor profile. This very popular tea is both lightly oxidized and lightly roasted to create a fresh floral aroma and pure light taste. Its blend of local Anxi Tie Guan Yin tea leaves harvested from high mountain bushes create a sweetly flavored tea that can be infused many times. Monkey Picked Oolong is a great choice for those looking for a mild taste with a pleasant fragrance. The name of this tea comes from a popular tale passed on in the oral tradition. It tells of tea bushes growing in the high mountains that were favored for their flavor but very dangerous to pick. The local farmers decided to train monkeys to harvest the tea leaves. Although nimble, the monkeys were not careful pickers and grabbed both new and old leaves. The result was a blend of leaves that created a tea with a special character and light flavor known today as Monkey Picked. Though we love the stories and myths that surround Chinese tea culture, we assure you that no monkeys are involved in processing this tea. Driving about 3 1/2 hours to the tea garden from center of Anxi County. Anxi wulong tea master Zhang Shuiquan has developed tea fields by his own hands year after year. Anxi wulong tea master Mr. Zhang Shuiquan checking the natural withering of the leaves outside in the sun. Tea bushes are organic, weeds that grow around them are pulled by hand and not by chemicals. The organic fertilizer is manure from goats that produces rich soil. Tangdi Village tea Zhang's family's old traditional yard house. The fresh tea leaves are given a chance to rest after being carried back from the fields. 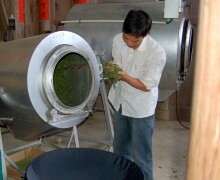 Young tea master Zhang Qing Jian checking how long the leaves need to be fried to stop the oxidation. The tea leaves are poured out after being fried inside the rolling machine for seven minutes at 210 degrees celsius. The tea leaves start to have red edges after oxidation. This machine holds a ball of anxi wulong tea wrapped inside cloth, rolling it to produce the shape. After rolling the leaves for about 12 minutes, the leaves are tightly packed in to a ball. 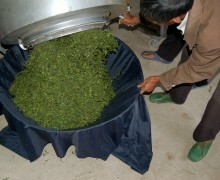 The producers loosen the tea and rewrap the leaves in cloth. The process is repeated more than 20 times so produce the tightly twisted shape.